A wonderful thing happened two days ago. 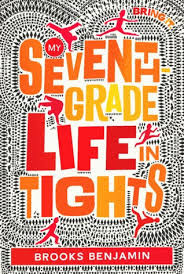 Brooks Benjamin's My Seventh-Grade Life in Tights became a real book that you can buy in a real bookstore (which you should totally do). 12-year old Dillon has the chance to compete for a summer dance scholarship and must decide what's more important: sticking with his crew or freestyling his way into solo greatness. I had the pleasure of reading an early draft of this book and can't wait to put it on my bookshelf. Equal parts funny, cringe-worthy, and heartfelt, you'll want to get up and dance* when you finish this book. Now that M7GLiT is out in the world, I thought it would be interesting to go back and look at the critique notes I gave to Brooks so you can get a backstage view of how this fantastic book came to be. Here are screenshots of my actual comments with some helpful tips on being a good critique partner. Tip 1: Highlight the first moment that the story grabs you. Ok. So I didn't even get to the first paragraph before M7GLiT made me startle my dogs. That was a good sign. Tip 2: Focus on the main character's journey. Make sure that the main character faces tough obstacles. In M7GLiT, it's middle school plus football plus dancing. Honestly, that's more than enough. Tip 3: Be honest about the small things. My dogs were frequently scared while I was reading this manuscript. Sudden laughter makes them skittish. Tip 4: Don't neglect the secondary characters. They may also be the stars of the show. In the case of Carson, he definitely is. Tip 5: Pay special attention to the emotional heart of the story. Tip 6: Speak up if you think you are being scammed by a 12 year-old posing as an adult. Disclaimer: As far as I've been able to determine, Brooks Benjamin is an actual adult. I've never had the chance to hug him in person but I know people who have. I trust their judgement. But when you read M7GLiT, you will see why I doubted this fact from the earliest moments. The voice is that perfect. This one sounds like a winner. Going to pick it up!! Thanks for sharing.